Resident Evil Knife – Influenced by Resident Evil 4. Fully Functional. Made by Scorpion Swords & Knives from Quality Heat Treated Steel. See Pictures, Prices, and Descriptions. Handle Width = 1 ½” at widest Weight = 1 lbs 4 oz. Handle: Black Linen Micarta. Scales attached with hidden pins & glued. 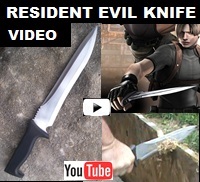 This knife is influenced from the knife Leon Kennedy uses in the game Resident Evil 4. Kennedy is a secret agent for the U.S. federal government, assigned to rescue the president's daughter from a sinister cult. At the climax of the game, Leon kills the cult leader Osmund Saddler.